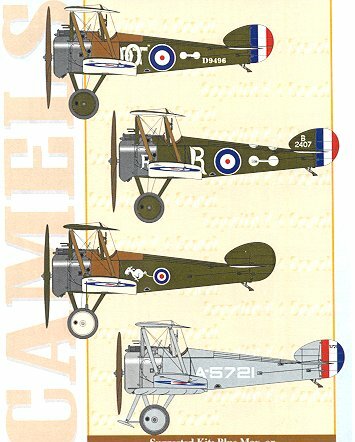 This is the second sheet for the Sopwith Camel in 1/48. The recommended kit is the rather pricey and not exactly easy to build Blue Max version, though there is no reason why it shouldn't fit the upcoming Eduard kit as well as the older Monogram/Aurora version. 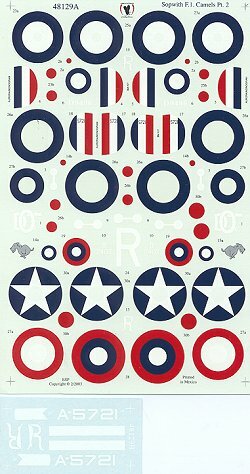 There are three RAF and one USN plane on the sheet. The RAF ones are in PC 10 uppers and bare linen undersides, while the USN version is in 'Battleship Grey'. First up is a 210 Squadron version from late 1918 in France. This one is named 'Dot' after the pilot's girlfriend or wife. Two Fokker D.VII's were claimed in this plane. Next is from 45 Squadron in 1918. This aircraft served in Italy during the summer of 1918. Note that the upstroke of the R on the fuselage side looks like a lady's leg! From 44 Sq is this night flying Camel based in England during late 1917. This one has all the white removed from the upper wing insignia and smaller then normal fuselage insignia. Finally, a USN Camel from Guantanamo Bay in Cuba around 1920. You'll note the hydro vane and flotation gear attached to this one which required a shorter than normal prop. Not shown is a 47 Squadron plane from the British Expeditionary Force in Russia around 1919 in support of White Russian forces. It carries Russian insignia. Review sheet courtesy North American Hobbies, where you can get everything at 20-30% below retail.